TLS is a protocol used by 2 networks to talk to each other in a secure way. For example, if you are making API calls from your system to Marketing Cloud you can indicate what security protocol you want to use. TLS has multiple versions 1.0, 1.1 and 1.2. 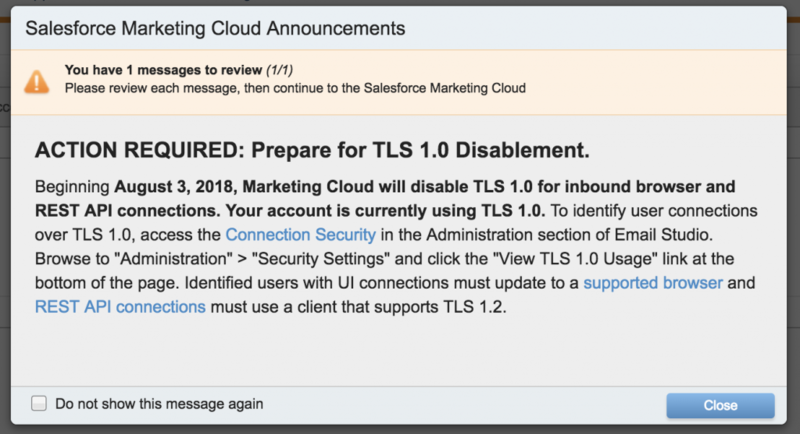 To stay on top of security standards, Marketing Cloud is not going to accept connections using TLS 1.0 anymore so the popup you saw when logging in this morning was because they probably detected connections using this protocol. If you are a customer working with a partner, I suggest you contact your partner and let them know about the popup you saw this morning. Browse to Admin –> Security Settings and click “View TLS 1.0 Usage” then go ahead and correct any integrations that use this protocol.